Dr. Richard Kring moved his medical office and pharmacy to this building in 1930. 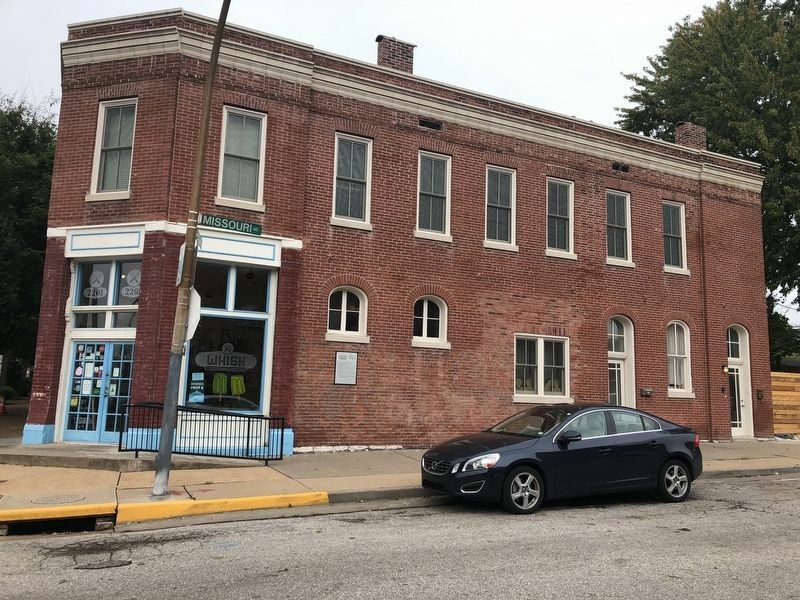 While Kring, who had lived and worked for years in the Soulard neighborhood, was the American-born son of German immigrants, many of his neighbors on Cherokee Street in 1930 were foreign-born. 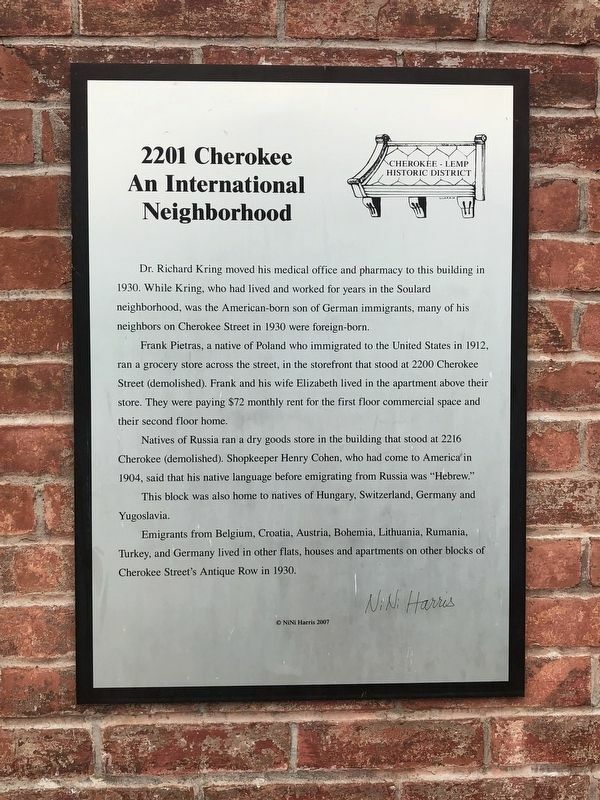 Frank Pietras, a native of Poland who immigrated to the United States in 1912, ran a grocery store across the street in the storefront that stood at 2200 Cherokee Street (demolished). Frank and his wife Elizabeth lived in the apartment above their store. They were paying $72 monthly rent for the first floor commercial space for their second floor home. Natives of Russia ran a dry goods store in the building that stood at 2216 Cherokee (demolished). Shopkeeper Henry Cohen, who had come to America in 1904, said that his native language before emigrating from Russia was "Hebrew." This block was also home to natives of Hungary, Switzerland, Germany and Yugoslavia. Location. 38° 35.589′ N, 90° 13.394′ W. Marker is in St. Louis, Missouri. Marker is at the intersection of Missouri Avenue and Cherokee Street, on the right when traveling north on Missouri Avenue. Touch for map. Marker is at or near this postal address: 2201 Cherokee Street, Saint Louis MO 63118, United States of America. Touch for directions. Other nearby markers. At least 8 other markers are within walking distance of this marker. Bardenheier Row (a few steps from this marker); The Birth of Antique Row (within shouting distance of this marker); 2215 Cherokee (within shouting distance of this marker); Life In The Fifties (within shouting distance of this marker); The Cigar Store (within shouting distance of this marker); South St. Louis Architect (about 300 feet away, measured in a direct line); 2225 Cherokee (about 300 feet away); 2301 Cherokee (about 300 feet away). Touch for a list and map of all markers in St. Louis. More. Search the internet for 2201 Cherokee. Credits. This page was last revised on October 11, 2018. This page originally submitted on October 9, 2018, by Devry Becker Jones of Washington, District of Columbia. This page has been viewed 50 times since then and 10 times this year. Photos: 1, 2. submitted on October 9, 2018, by Devry Becker Jones of Washington, District of Columbia. • Andrew Ruppenstein was the editor who published this page.